McALLEN — The first District 1 forum began with a zinger, an autobiography and a doughnut. 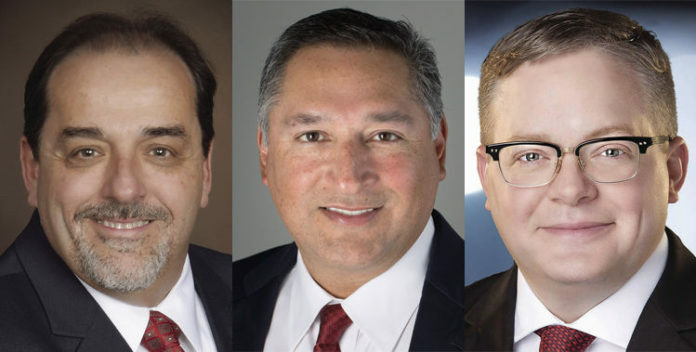 During opening statements, attorney Javier Villalobos criticized fellow District 1 commission candidates for not having municipal experience; physician Joseph M. Caporusso listed what he believed were his qualities that would make him a valuable candidate; and businessman Timothy Wilkins used a doughnut to help illustrate some of McAllen’s problems. The three candidates are vying for the District 1 seat being vacated by Commissioner Richard Cortez, who is running for county judge and must therefore resign his seat. The election for the northeast McAllen district is set for Jan. 20. Early voting begins Jan. 3 and will run through Jan. 16. The last day to register to vote is Dec. 20. The last day to apply for a mail-in ballot is Jan. 9. Since McAllen elections are won by a majority, more than 50 percent of the vote will be needed to claim victory. If not, there will be a runoff. Hoping to give voters some insight, the three candidates gave opening statements, rebuttals and took questions from the roughly 50-person audience at the McAllen Citizen’s League luncheon Thursday. Current McAllen commissioners Omar Quintanilla and Joaquin “J.J.” Zamora attended. Wilkins, CEO of CADTax Property Tax Consulting, also owns Sofie’s ‘SS’ Saloon. “But if you want somebody that is skilled and experienced and knowledgeable in the municipal arena; someone who has represented governmental entities for 19 years,” said Villalobos, former Hidalgo County GOP chairman, referring to himself as the most qualified. Villalobos is the former attorney for the city of Donna and told The Monitor this week that he’s “always interested” in taking a job with a municipality “as long as it doesn’t compete with McAllen.” He said he did not want to take on cities that potentially rival McAllen because of his candidacy for the commission. Caporusso, who repeated the phrase “leadership with experience where it counts” several times, listed his experiences as qualifications for office. They include running a small business (his podiatrist office), serving on the Friends of Quinta Mazatlán board, serving on the advisory board for the Convention Center and being an elected official as a former McAllen school district board member. “And I’ll see you in my office if you have a foot problem,” Caporusso said with a laugh. Wilkins then paraphrased Albert Einstein. “We cannot solve our problems with the same thinking that created them,” he said, pulling out a doughnut. “I symbolize the current state of affairs of McAllen with a donut. It’s a little bit funny and catchy but the symbolism is that right now, all of the surrounding towns have outperformed McAllen with business development, housing starts, infrastructure and a variety of things. That’s not to say McAllen’s not doing well, but there’s an awful lot that can be improved upon. Villalobos continued to tout his municipal experience, as well as his involvement fighting last year’s healthcare district. Caporusso used his platform of being a small business owner and physician to explain issues surrounding the city and a willingness to assess them before making a decision. Wilkins explained how he has studied what he believes are the issues, and has ideas to help solve them.